Happy Friday! It’s the first tip of 2019! Fan dancing is much easier when your fans are right-and left-handed. It’s quiet right now at BeauTease headquarters and we’re using the downtime for some skill-building. Everyone was eager to learn fan dancing and this tidbit came up while I was teaching. As you can see from the pictures, the staves of my fans open in different directions. This means you can hold the fans comfortably with the top stave closest to you. Most ready-made fans are right-handed, which makes holding them in your left-hand awkward. 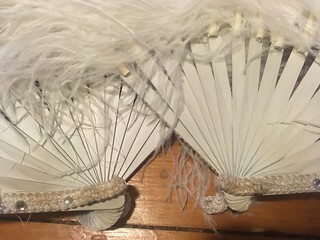 It’s best to have the staves reversed for the left-hand fan before the fans are constructed, because it requires removing the support cord and restringing the staves. When ordering fans, specify that you want one right and one left. At first, it can be hard to remember which one is which. You can discretely label them with an L and R on the back stave where it will be hidden by your hand. Or you could add a distinctive decoration to one fan, so you’ll know that one is, say, the right-hand fan and the one without is the left-hand. If it were a large rhinestone on the back of one fan, you could tell which was which by touch.